The St. Patrick’s Day Parade & Run does more than just provide a tremendous civic event for the citizens of St. Louis. 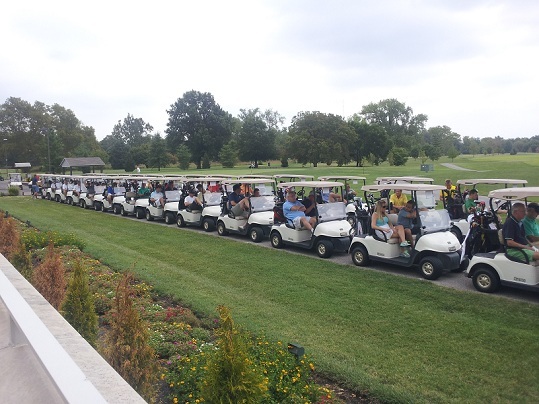 On August 12, 2015, the St. Louis Metropolitan St. Patrick’s Day Parade and Run hosted the first annual Irish Classic Golf Tournament to support Carney’s Kids Foundation. Many attended the event. Carney’s Kids Foundation provides financial support for not-for-profit organizations whose primary goal is to improve the lives of children. They support organizations seeking to enhance the quality of children’s lives by improving their health, both physical and emotional, providing educational assistance, improving the environments of children living outside a family home or supporting families in need and provide disadvantaged children with pathways to their own potential. 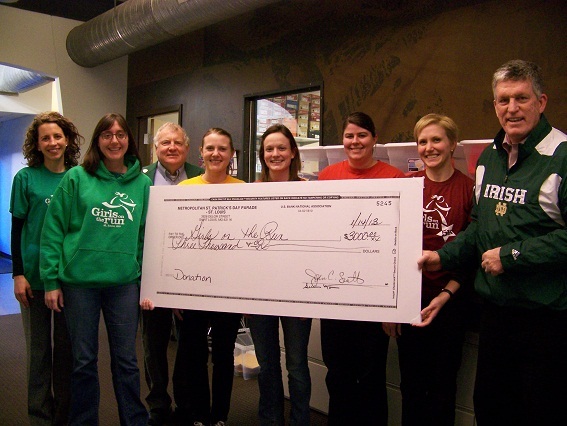 (l-r backrow) Wayne Price, the Shriner’s parade marshal/parade chairman, accepts a $2,000 check for the St. Louis Shriner’s Hospital from Metropolitan St. Patrick’s Day Parade and Run in St. Louis. Presenting the check is Susan Morton, president of Data Dash and Chairperson of the Annual St. Patrick’s Day Parade in St. Louis; Jack Morrison, Shriner’s parade marshal emeritus. (l-r front row) Debbie Steel, mother of triplets with daughters Paige, who suffers from Spondyloepiphyseal Dysplasia Congenita (SED) and is being treated at the Shriner’s Hospital, and Sidney on her lap; John, father of the triplets, holding daughter Marina; at the check presentation at Data Dash‘s office in Farmington, MO. The Shriner’s play at integral role in marshaling the annual downtown St. Louis Metropolitan St. Patrick’s Day Parade and Run. Girls on the Run St. Louis (GOTR-STL) is a non-profit whose mission is to empower girls for a lifetime of healthy living. For more than 10 years we have provided an innovative physical activity positive youth development program serving more than 10,000 girls in the Greater St. Louis area. We envision a world where all girls will value themselves, lead healthy and purposeful lives and influence the next generation. Learn more at www.girlsontherunstlouis.org.